The ultra-accurate standard error calculation of fits known as bootstrapping now supports Global/local regression datasets for both global and local variable regressions with/without equation constraints with/without multiple datasets with/without uneven time steps/unlimited data points with/without global/local initial conditions and with/without parameter constraints. This version comes with several published models in ACS/Elsevier journals. Kintecus is the only code in the world that can do this. You longer need Matlab, nor Origin, nor Igor, nor JMP to workup your data and/or painstakingly create special scripts to analyze your data. "Huang, Z.-S.; Wang, L.; Liu, Y.-L.; Jiang, J.; Xue, M.; Xu, C.-B. ; Zhen, Y.-F.; Wang, Y.-C.; Ma, J., Impact of Phosphate on Ferrate Oxidation of Organic Compounds: An Underestimated Oxidant. Environ. Sci. Technol. 2018, 52, (23), 13897-13907." A few enahancments:A fix for thermodynamic databases that have coefficients with positive exponents represented by a space such as "1.234E 32" (it should be read in as 1.234E+32) or "9.874E 12" (9.874E+12) The older versions of Kintecus would read them as "1.234" and "9.874". Note that exponents with lower case "e" such as "1.234e 32" were always read in correctly by Kintecus. bug corrections for user defined constraints in regressions, other bug fixes. - If you are getting "fatal error # 995 This version of kintecus has expired". Please download this version to correct that error! "Global Data Fitting/Regressing with Multiple User Defined Constraints"
* You must define all variables utilized in the function as a comma delimited list. and cXXXXXXX for concentration of species XXXXXX, ie. concentration of CH4 would be cCH4. multiply it by minus one (-1), so 1^-0.6 become 1^(-1*0.6). as an example of various user defined chemical kinetic rate equations. One can now also regress/fit the initial conditions for a species (or temperature) in any of the initial_conditions.txt file. This can be done by suffixing any numeric value in an initial condition file with a question mark, “?”. temp=610 ; isoprene=1.73e14 ; O2=2e19? A new Kintecus Workbench. Easy GUI launching of models/codes/scripts and allows one to add your own models/scripts/documentation/etc. Also, there are bug fixes, primarily in "Global Data Fitting/Regressing with Multiple User Defined Constraints"
1/1/2018 - If you are getting "fatal error # 995 This version of kintecus has expired". Please download a temporary executable located on the download page. Kintecus 6.01 has been released. This version can also apply any type of constraints in equation form between any of variable or constants for use in regression/fitting. Several dozen LLNL models have been converted over to Kintecus. Several Biodiesel model surrogates, gasoline surrogate, diesel surrogates and their reduced models as well as some pure models (isooctane, carbonates, etc). There are also some organophosphate and TNT models from LLNL converted . Also, the ck2kin (Chemkin to Kintecus converter) has been updated and should be able to handle most new chemkin models especially those at LLNL (where all the models below originated) and those at Combustion Chemistry Centre at National University of Ireland, Galway. The C3 lab has some useful models such as ARAMCOMECH 2.0/3.0 (2016/17) models which Kintecus fully supports. A few more bug fixes with the beta version of Kintecus. (download rar file here, you'll need unrar to unrar the executable). Kintecus 5.9b beta (download rar file here, you'll need unrar to unrar the executable). Also, the ck2kin (chemkin to Kintecus converter, click here to download) has been updated and should be able to handle most new chemkin models especially those at LLNL (where all the models below originated) and those at Combustion Chemistry Centre at National University of Ireland, Galway. The C3 lab has some useful models such as ARAMCOMECH 2.0 (2016/17) models which Kintecus fully supports. Kintecus 5.8b beta (download rar file here, you'll need unrar to unrar the executable). This version should be able to handle most of LLNL combustion models minus those that contain PLOG// entries. It can also apply any type of constraints in equation form between any of variable or constants. I will be support PLOG// in Kintecus in a few weeks. I've converted several dozen LLNL models over to Kintecus. Several Biodiesel model surrogates, gasoline surrogate, diesel surrogates and their reduced models as well as some pure models (isooctane, carbonates, etc) have been ported. There are also some organophosphate and TNT models from LLNL converted . Also, the ck2kin (chemkin to Kintecus converter, click here to download) has been updated and should be able to handle most new chemkin models especially those at LLNL (where all the models below originated) and those at Combustion Chemistry Centre at National University of Ireland, Galway. The C3 lab has some useful models such as ARAMCOMECH 2.0 (2016/17) models. Kintecus V5.75 has been release! Kintecus V5.5 has been released! -3- Users can utilize the OUTC operator(b) for a species for reaction rates that involve families of species such as "ROH=[C2H5OH]+[C3H7OH]+[C4H9OH]+..."
-4- More issues with boot-stapping and global regression analysis have been corrected for Windows 8 and up. -5- Kintecus package also comes now in non-package form. You won't need admin privileges to "install it", *BUT* you WILL NOT HAVE a nice, easy clear Kintecus START menu that identifies the hundreds of sample Kintecus files. Installing the package form is highly recommended! Kintecus V5.5 and up now support some of the special IUPAC chemical kinetics forms from the Master Chemical Mechanism (MCM) ( see http://mcm.leeds.ac.uk/MCM/parameters/complex.htt , http://www.iupac-kinetic.ch.cam.ac.uk/ and/or http://iupac.pole-ether.fr/ or Google/Bing "Master Chemical Mechanism"). Most of the these forms pertain with special pressure fall-off reactions that cannot be fully cast into the traditional Troe, Lindemann forms. Shown below are some those forms. The sample Kintecus-Excel worksheet Kintecus_MCM_examples.xls workbook contains examples of each MCM reaction explained below. Note that some of these forms have sub-forms that perform differently depending on the amount of parameters given. Also note that all rate forms shown below include k(T)=A*T^m*exp(-Ea/RT) as part of their rate equation form but they are not explicitly shown as part of it. Also, under the Windows Kintecus TOOLS start-menu is a utility (for linux users it is under the MCM sub-directory), created by Dr. Fred Winiberg of JPL, that will convert most FACSIMILE codes containing MCM kinetic forms to a Kintecus MODEL spreadsheet. For more details please see manual. 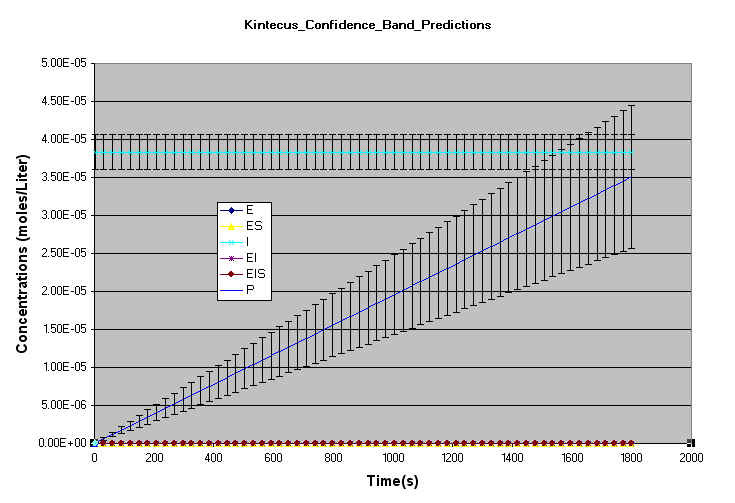 Kintecus V5.5 and up now support the Chebyshev expansions proposed by Venkatesh for representing pressure fall off and temperature dependant rates of multiple well reactions. Please see those references for the list of equations that are utilized in Kintecus to calculate those rates. The presence of the CHEB keyword will cause Kintecus to look for a text file named chebdata.txt. The text file chebdata.txt will contain all your reactions that might use a multiple-well, multiple-channel Chebyshev polynomials reaction. For more details please see manual. -3- Users can utilize the OUTC operator for species for reaction rates that involve families of species. Please see the Kintecus-Excel workbook Kintecus_workbook_MCM_examples.xls as an example. Note the OUTC[ ] operator present in the "Species Special Directives" columns inside the workbook Kintecus_workbook_MCM_examples.xls . Species RO2 will always be equal to the sum of the concentrations of CH3O2 and CHO for whatever reaction the species family RO2 appears in. It is possible to define one species family with other families. One could have R=RO2+RH where RH is the sum of another set of species. Just be sure the larger families appear further down in column A as Kintecus sums the families top to bottom. to latch on and regress against. Transport catalytic reactions are concerned with gas to liquid interactions. only happens when one is utilizing thermodynamics mode (the "-THERM"
-Kintecus will detect Infinite loops with regression/optimization and either halt/restart the optimizer. -During SCANNING runs, it seems in Windows Vista/7 would interfere with the just created Kintecus SCANNED files. - reactions that have more than three products and fraction stoichiometric coefficients (global reactions). - more minor corrections to third-body reactions with enhanced body coefficients. Kintecus V4.35 has been released. This version has some minor corrections to third-body reactions with enhanced body coefficients. Kintecus version 4.10 has been released for both 32- and 64-bit Windows systems and a 64-bit version for Linux. Those that utilize the thermodynamics mode of Kintecus with constant-pressure and/or constant-volume and/or bimolecular Lindmann pressure fall-off reactions (i.e. A+B+M[LIN;1.2;2.1;4400] ==> ... ...) will want to download the new version and test against their models as two possible bugs were discovered. Under the new code, one's models might show temperature changes from 5%-30% depending on the heat capacity change accompanied by temperature changes with constant pressure. Some might see little changes (the sample O2-H2 constant pressure combustion model that comes with Kintecus shows little change). Those working under a constant-volume with thermodynamics and have no bimolecular Lindmann pressure fall off reactions can ignore this update. Kintecus version 4.01 has been released for both 32- and 64-bit Linux systems. Please go to the download page to obtain the corresponding tar files. Also, a new educational license scheme has been released for University/College supercomputing centers that have Linux systems. It is possible to install Kintecus on those systems for free. Please contact jianni10 at the address of @gmail.com for details. the DASPK integrator that can be invoked through "-INT:5" switch. This new integrator can handle tough combustion models that can break the other integrators. In some cases speedups of over 100 times (10,000%) are possible. For example, the Chlorate-Iodine sample reactions model takes about 3 minutes to run utilizing "-INT:1", but finishes under 2 seconds with the DASPK integrator. Note that it is not a silver bullet and it is still recommended to stick with the first integrator, "-INT:1", then followed with the DASPK integrator, "-INT:5", if continued problems persist, then followed by #4, #2 and #3 integrators. See manual for further details. The chemkin to Kintecus converter tool and the other tools have been recompiled and should run under Windows7 as well as Windows Vista/XP. The linux versions (32 and 64 bit) should be released in a week or so. Note that all speedups are attributed to a recompiling of the Kintecus source code utilizing the Intel 11.1 FORTRAN compilers. Spectacular speedups on the orders of magnitude are possible with the new DASPK integrator invoked through the "-INT:5" Kintecus command switch. The old 3.96 version of Kintecus required 2 hours and 2 minutes. The new version completes it in 1 hour and 10 minutes and the 64 bit version completes the run in 1 hour 2 minutes. CASE #2) Execution of the test.bat batch script that runs most of the batch models in the Kintecus directory. This amounts to several dozen runs featuring combustion, wet chemistry, Normalized Sensitivity Analysis, uncertainty analysis, regression, optimization, global equilibrium runs, cluster analysis, parametric scans, perturbation runs and many other type of runs. The old 3.96 version of Kintecus requires 18 minutes to run test.bat. The new 4.0 version completes all runs in 8 minutes. several months ago: There is a slight issue with Windows-7 and the Kintecus-Excel spreadsheets (see below). fix (see below) if this issue is an annoyance. this version if you really need it. The next release of Kintecus will have it available. with direct support of Intel's Ultra-highspeed QuickPath (on the Core-i7 chips) for double-precision numbers. Kintecus V3.962 has been released to correct the problem with reactions that have more than four products. this problem, please download Kintecus V3.961. Kintecus version 3.96 has been released. - Support for up to 10 products. You can now do some serious global reaction modeling. - Weights/standard deviation support for experimental data during fits/regression. any data analysis with such an experiment. in a constant pressure run. normalized sensitivity analyses. This is useful for mechanism reduction and elucidation. thousand and have them all specified and easily seen/plotted on an optional Excel worksheet. a Normalized Sensitivity Analysis coefficient of zero (0). Kintecus V3.96 has this bug corrected. version 3.953 and re-run any previous scans to be sure one's output does not significantly change. the first two integrators occasionally cannot handle. Kintecus V3.95 will not run at all without a valid unlocking key that is unique to each computer. Also, some minors bugs have been fixed. were initially indiscernible or hidden. "Why should I care about that?" and also positively correlate (or negatively or zero) correlate with other species? positively, zero or negatively correlated with all the modeled species temporal profiles. Again, this can be grouped into a pictorially or numeric output. >> Which species concentration profiles tend to stay in the same range of concentration values? A much more thorough examination can be read in the Kintecus documentation . to see how to set up a Combinatorial Scan). Why should I care about that?" primarily for plasma and nuclear reactions. * When one was examining the true equilibrium composition of a system over a wide temperature range, occasionally the system would not converge at some temperature values. The final plot of such a system would show spikes at the non-converged values and the user was forced to either drop that point, or change the non-linear solver values by hand until the system converged. You DONT have to do this anymore. 4) Coupling of combinatorial scanning with output files such as system thermodynamic output, rate fluxes, species fluxes, cluster analysis, Jacobian output, eigenvector/eigenvalue output of the Jacobians. * Helps one to determine ALL the possible maximum and minimum concentrations, temperatures, System Cp, H, G, viscosity, rates, fluxes that a system can have if one varied species X and Y (or temperature or pressure) in all possibilities and combinations? 1) If you tried to compute the eigenvalue and eigenvectors of the Jacobian matrix, this would cause an instant crash. This has been fix as of last year, but I only handed that version out to those that asked about this bug. 2) You can now create more than 100 (up to 1,000) Normalized Sensitivity Analysis Matrix files. If you are planning to perform chemical mechanism reduction and elucidation with Atropos make sure you download the updated Atropos program (V1.1). Other general enhancements and minor issues resolved. the species present at the respective current temperature. - the regression/optimizer is more robust. Uncertainty Analysis: Poisson and Gamma. rate constant of a reaction multiplied by 1/Keq, i.e. 10 rate constants to fit. will run and not crash. inlets of a CSTR/PFR run. See below under the December 13th, 2004 news to see some of the new features! - What is the maximum dosage the patient can take? - What is the chance that the boiler/CSTR/PFR might explode or have low yield? low [OH] concentrations or visa-versa ? during the course of all the simulations. plot uncertainty/confidence bands, system properties and various bug fixes. more statistical gauges than other "SASSIER" programs that just do statistics. Oregonator oscillator/clock reaction constant fit! you have Kintecus use your own plot templates automatically! - Now you can finally control Kintecus through the new dynamic mode! Kintecus V3.5 has a new mode that allows one to pause Kintecus, examine the current concentrations, temperature, rates, system properties, residence times, external concentration, etc, alter any of those properties, and continue. This allows one to control Kintecus dynamically in a feedback manner. Feedback control can be a very complicated and broad area which is beyond the scope of this document. Please consult an appropriate text book on this subject. Dynamic mode in Kintecus is invoked through including the "-dynamic[:wait time]" switch on the command line. A very simple example is provided through using VBA scripts to control Kintecus in dynamic mode is provided as Excel Workbook, "Combustion_H2_Dynamic.xls". Again, any programming language that can output files can be used to control Kintecus. Where X represents the column number in your fitdata file/worksheet and Y represents the starting weight guess. - CONSTRAINTS! You can now apply a constraint to any parameter you are optimizing/fitting. The constraints allow one to specify lower and upper bounds for a parameter. Constraints are applied by appending your guess with (lower<upper) where lower is the lower numeric bound and upper is the upper numeric bound. For example, to constraint the initial temperature guess of "3000?" to lay between 1500 and 4000 simply type: "3000(1500<4000)?" . - TWO (2) new optimization methods, Levenberg-Marquardt method and "The Complex" (the Simplex method on steroids). 1) A numerical value representing an external Heat Source/Sink. This value will be added to the dT/dt equation and with units in Kelvin/sec. 2) A filename containing a profile (formatted like a "Constant File?" file) that represents a changing External Heat Source/Sink # Profile (Filename) with units in Kelvin/sec. There will be a few more Excel workbook samples (though Excel is not needed to run those Kintecus examples), such as computing a volume profile of a piston and using that in a GRI-MECH 3.0 run. There have been a number of minor bugs fixed and most of those will go unnoticed, but if you are working with constant-volume (isochoric) adiabatic runs (in kinetics mode, not equilibrium mode) or are applying a "Constant File" to a species in thermodynamic mode then the following two major fixes will apply to you. Those of you that only use Kintecus in Equilibrium Mode can ignore these two major bug fixes as they only pertain to Kintecus in chemical kinetics mode. * The constant-volume (isochoric) thermodynamics in some non-isothermal adiabatic runs have been corrected so some users might see the correct higher temperature. Again, this is model and initial condition dependent so some users might not see any change while other might see final temperatures change upto 40% and ignition delay changes of 10-30%. Example, the five GRI-MECH samples that come with Kintecus show almost NO CHANGE, BUT the three ethanol combustion runs show some changes in ignition delays. For those that are performing runs in CONSTANT-PRESSURE, then you can safely ignore this bug fix, constant-pressure mode works fine. * Running Kintecus in chemical kinetics mode with thermodynamics and using a "Constant File" (an external concentration profile) on a species can cause the previous versions of Kintecus to immediately bomb out with an "Overflow" error. This made it appear it was an integration problem, but it never was an integrator problem. The values in your Constant File were accidentally set to either zero or to a colossal negative number. This has now been fixed and is working properly. write to your Kintecus Path (usually "C:\Program Files\Kintecus" ). Macro to right under the last DIM statement. KPATH = KPATH & "\"
If L <= 1 Or PC = "" Or PC < "A" Or PC > "Z" Then PC = "C"
and Jacobian output features helpful.